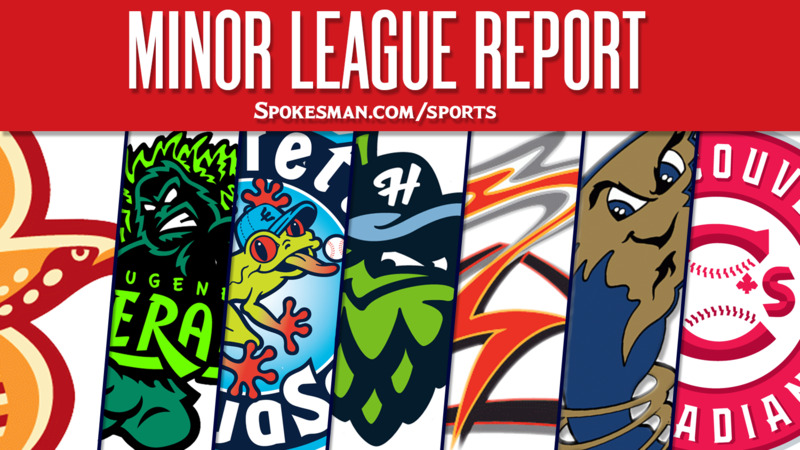 Eugene 8, Spokane 3: Jeff Passantino struck out eight over six innings and the Emeralds () dropped the visiting Indians (6-4). Starter Ryan Dease was roughed up for seven runs on 11 hits with no walks and four strikeouts. Austin O’Banion hit a solo homer, his second of the season. Hillsboro 7, Vancouver 4: Andy Yerzy and Geraldo Perdomo hit solo homers and the Hops (7-3) topped the visiting Canadians (5-5). William Gorman went 2 for 4 with two triples for Hillsboro. Salem-Keizer 6, Tri-City 4: Aaron Bond hit a go-ahead solo homer in the eighth and the visiting Volcanoes (5-5) beat the Dust Devils (5-5). Diego Rincones went 2 for 5 with an RBI for S-K.
Boise 4, Everett 2: Luke Morgan went 4 for 4 with two runs and two stolen bases and the visiting Hawks (3-7) downed the AquaSox (5-5). Justin Valdespina (2-1) allowed one unearned run on three hits and two walks over five innings for Boise. Albuquerque 5, Round Rock (AAA) 4: David Dahl drove in Raimel Tapia with a double in the seventh inning and the Isotopes (52-58) edged the Express. Franklin Rollin went 2 for 3 with a two-run homer for Round Rock. Earlier, the Express beat the Isotopes 12-5 in the completion of Wednesday’s game. Cliff Pennington went 3 for 6 with a homer and four RBIs in the opener. Frisco (AA) 4, Corpus Christi 1: Jonathan Hernandez allowed one run on three hits over 5.2 innings but walked five with six strikeouts and the RoughRiders (48-63) beat the visiting Hooks (68-42). Michael De Leon collected three hits and Luis Yander La O drove in a pair. Down East (High-A) 5, Myrtle Beach 4: Leody Taveras went 3 for 5 with three RBIs and drove in a run in the ninth with a single and the Wood Ducks (48-63) edged the Pelicans (50-60). Yanio Perez hit a two-run homer for Down East. Jacob Lemoine (W, 2-4) struck out three over two hitless innings, but walked three. Hickory (Low-A) at Hagerstown (ppd. ): Rainy night in Hub City. Will make up on Saturday. Published: Aug. 3, 2018, 5:55 a.m.